Why I Hunt Barebow, Always Have, and Always Will - Bow Hunting by Barebows! On September 17th, 2004, I was fortunate enough to become the first archer ever to complete the North American Super Slam of big game with no sighting devices of any kind attached to any of my bows. Though some of the 29 different species were harvested with a compound, some with a longbow, and some with a recurve, all were taken by means of purely instinctive shooting. Throughout my lifetime, I have never hunted any other way. In 2006, I went back to my roots and put away my compound bow for good. Long before the compound reached commercial production, I had been hunting with stick bows of different types and makes — taking, among other species, during the 1960’s and 1970’s — Mule Deer, Columbia Blacktails, Rocky Mountain Elk, Roosevelt’s Elk, and one Rocky Mountain Goat. WHY did I decide to return to my roots in traditional archery, as I began to follow those hunting trails into the so-called “retirement years” of my life? I guess the answer boiled down to something no more complicated than this: I simply derive more personal joy and pleasure from launching arrows that way, and from hunting with the more primitive weapons that require you to get much closer to your quarry before an ethical shot can even become possible. Even during the numerous hunts I did take with my compound bow in hand, I never used any sights, release-aids or triggers — only three fingers on the string (one above the nock, two under). The challenge of aiming an arrow accurately, at whatever distance you find yourself from your quarry, has always been for me the single most fascinating part of archery. Much of the romance of the sport seems to lie in the exhilaration of watching the arrow in flight as it completes its arching trajectory to its target. The slower the speed of the arrow, the greater the arc, and the longer that sense of exhilaration and anticipation lasts. With high-tech archery gear today, and arrows often traveling well over 330 fps, sometimes one can hardly see the arrows in flight — especially in weak lighting conditions. With such equipment, some bowhunters can routinely hit a grapefruit at 80, 90, or even 100 yards. In such cases, our beloved sport becomes less one of hunting, and more one of marksmanship. Have you ever noticed that when rifle hunters boast about their kills in the field, it’s almost always about how long a shot they made? 382 yards. 469 yards. 591 yards? And is it not true that, whenever an archer brags about a kill, if — indeed — he or she does, it’s usually about how close the bowhunter got before taking the shot? Regardless of choice of weapon, I submit that — the longer the shot taken — the more it becomes a challenge of marksmanship, and the less an exercise of one’s hunting skills. And don’t ever forget this unalterable truth: Bowhunting is the near-perfect embodiment of Murphy’s Law — namely, that, if something can go wrong, it often will. From 100 yards distant, at the crack of a rifle, a deer cannot relocate its vitals fast enough to avoid the lethal shot. Yet with a high-tech bow — even with the fastest bow with the lightest of hunting arrows — an animal that goes into motion at the instant of the bowstring’s release will almost always turn a “perfectly aimed” shot into a poor hit, or else a total miss. That can even happen at 20 yards, let alone 50, 80, or 100 yards! If I do miss at 25 yards or less, I’m close enough to be able to see whether I missed or not, OR — if I got a poor hit — to see where the arrow struck my quarry, so that the follow-up can be more wisely planned. The bottom line is that, the longer the shot, the more uncertain I’m likely to be as to what really happens when the arrow arrives in the vicinity of its target. Barebow hunting forces the ethical hunter to take shorter shots, thereby increasing his or her instant knowledge of the shot’s result. Hunting for me has always embodied my attempts at time-travel backwards, to reconnect with my Paleolithic ancestors. The more primitive my bow and archery tackle, the more easily I’ve been able to merge myself into that identity of Everyman, from ages buried in the distant past. As for the challenge of getting within bow range of wild animals, my many decades of hunting them in the wilderness areas of North America have taught me a lot about their natural defense systems. Most big-game animals possess what I call a “red-alert zone,” which extends to a radius of about 50 yards all around them. Penetrate that invisible “wall,” and it becomes a real challenge to remain undetected for long. Yet, depending on the size of your quarry, an ethical, fair-chase, barebow hunter will usually need to get within 15 to 30 yards, before a shot opportunity is possible. And even then, at such close range, it may be necessary to lie in wait for long periods of time — perhaps hours, on occasion — before the bedded or feeding animal rises or enters your only available shooting lane. OR, finally gives you the chance to sneak closer. The above paragraph describes what for me is the supreme thrill of the hunt: being able to observe a wild animal at very close range, without that beautiful creature knowing that any danger is present. Their senses of sight, hearing, and smell are so very much keener than our corresponding human senses that escaping detection at close range by a mature wild animal, for any length of time, is a huge victory all by itself — regardless of whether you ever get to release an arrow or not. If things finally do come together to afford you that shot you are so ardently hoping for, by then it is often almost anti-climactic! For a modern archer who chooses to use sight-pins for aiming, he or she is not necessarily required to penetrate that buck’s or bull’s red-alert zone in order to achieve success. I guess what it comes down to is breaking hunting into its component parts and prioritizing which elements of the hunt give each of us the most pleasure or personal satisfaction. For me, that prioritization has always dictated that I hunt with a bare bow — devoid of any sighting mechanisms — precisely because I know I must get much closer to my quarry than I would otherwise need to. Add to that the fact that fast target acquisition and the pure speed of instinctive shooting are the best way to hunt in brushy terrain — and at very close ranges, if a person is willing to put in the time it takes to develop such skills. Whether one hunts with sighting devices, or purely instinctively, there are — needless to say — a number of advantages and disadvantages to whichever choice one makes. The advantages of hunting with high-tech archery gear are pretty well understood by everyone: faster arrow speed, flatter trajectory, greater killing range, more frequent pass-through penetration, more frequent returns home with meat or trophy. However, I’d like to discuss several distinct drawbacks to hunting with modern archery equipment, as opposed to hunting with traditional bows. First, during foul weather conditions, you may suddenly find, just as you come to full draw, that your pins have been rendered unusable by snow, ice, or a big raindrop that has stubbornly taken up residence inside your peep-sight. Second, in the excitement of the moment, or in your haste to come to draw, you may unwittingly use the wrong pin as you quickly get the shot off. Third, those golden shot opportunities are often very fleeting and may not give you time to get a reading from your rangefinder. Thus, you must sometimes either guess at the distance (risking a wounding) or pass on the shot altogether. Also, should you happen to accidentally sever your bowstring while on a wilderness hunt, you’re royally screwed with a compound — unless you happen to have brought a bow-press with you (or else a backup bow). With a traditional bow, you simply bring out your backup bowstring, and you’re quickly in business again. “Through our binoculars, we watched the bull gradually work himself (with a little help from us) into an absolute rage. Pretty soon he was using his powerful neck and antlers like a scoop on a D-6. His scoop, however, was spring-loaded! Deadwood debris of all sorts started flying through the air. Whole lodgepole spars were uprooted and tossed aside. This was one agitated bull! Or else a Master Actor! Richard and I couldn’t see any cows around him, so he must have figured we had some, and he was fixing to come and get ours! “And come he did! First, however, the intimidation card had to be played to the fullest. Once he figured his awesome display of power had sufficiently intimidated his rival, the rush was on. There was certainly nothing slow-motion about this approach! 300 yards and closing fast. A few paces in front of us was a small clearing — perhaps 18 yards in diameter. Richard urged me to “set up” quickly on its back margin, while he would retreat 50 yards to do some soft “grunting” under cover — all the while keeping me between himself and the oncoming bull. I barely had time to kneel at the edge of the clearing and nock an arrow before the bull suddenly landed in my lap, so to speak. “The giant animal arrested his motion directly across the little clearing from me. Heaving hard, red-eyed, and drooling at the mouth, he was so ready for a fight it made my skin crawl! As I gazed upward from my kneeling position at his massive antlers rising nearly 10 feet off the ground, for the first time in my life I was feeling truly intimidated by an animal (other than a bear). The bull’s eyes were looking right over the top of me, trying to find the “other” bull he could not see. Since the wind was in my favor, and since I was wearing a camo head-net over my face, as well as similar gloves on my hands, I knew he would not likely notice me — unless I made some slight motion. I even tried to forgo blinking. My bow was vertically upright, ready to shoot, with the lower wheel resting on the ground. And thus the static drama continued on hold for several minutes, with neither of us budging a millimeter. He simply had no idea I was on my knees there in front of him — even though we were facing each other directly, only 18 yards apart. “I found myself wondering if I could possibly come to full draw on him without triggering a charge. Did I dare take the chance? As I tried to screw my courage to the “sticking” point (please pardon the pun), I suddenly noticed that about five feet in front of the behemoth was a willow sapling rising to the base of his neck. No more than an inch in diameter, it nonetheless cut his brisket exactly in half as viewed from my fixed vantage point. Were I to attempt a front-entry shot directly into his “boiler room,” the arrow might well glance off the side of the sapling and be deflected into one shoulder or the other. The chance of merely wounding the bull was not one I was eager to take. The big fellow was already angry enough without my further inflaming his rage! “Waiting for my opponent to turn and give me a broadside shot seemed by far the more rational thing to do. IF he would only turn! The standoff continued for several tense, agonizing minutes — each of us searching for something we could not find. Then, suddenly, with no signal or warning, the bull wheeled on a dime and trotted straight away from me. As soon as his motion began, I started my draw, but it was too late. By the time the wheels of my compound bow turned over and I “lurched” into my anchor position — so I could then stabilize and take proper aim — his last rib was disappearing from view, leaving me with only a rump for a target. I never got the shot off at all. “The sense of disappointment was crushing, to say the least. So near and yet so far! While Richard and I made our weary way back to the boat, I remembered something my friend, Duke Savora, had told me the previous autumn. It had puzzled me at the time. “’Because someday you’ll miss your chance at a superb trophy animal simply because you won’t be able to get your shot off fast enough,’ was the reply. I missed my chance at this giant Alaska-Yukon bull, because I had the wrong type of bow in my hand for that particular situation. The spread to his rack was easily over 60 inches, and he had very long, broad palms, with lots of points on each side. Neither my guide nor I had much doubt about his being an all-time Boone & Crockett trophy animal. Those “once-in-a-lifetime” chances are called that for good reason; namely, because you almost never get a second opportunity at the same animal, or even at another trophy animal of comparable quality. 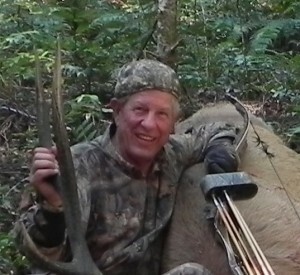 In my next blog, however, I will recount the story of my SECOND “chance-of-a-lifetime” encounter with another Alaska-Yukon Moose of Boone & Crockett quality. This time, I had a recurve bow in hand, but I simply “blew it” — for a reason quite in keeping with the fiendishness of Mr. Murphy. Stay tuned!